Bar/prep faucets go beyond the kitchen, to butler's pantries, morning kitchens and more. Touch on. Touch off. With Touch2O. Technology, it doesn't matter if you have two full hands or ten messy fingers. Tap anywhere on the spout or handle of the faucet with your hand, wrist or forearm to start and stop the flow of water. Thoughtfully designed to make kitchen tasks easier, Touch2O Technology allows you to turn the faucet on and off with just a touch anywhere on the faucet's spout or handle. It was the first innovation of its kind on the market, and now offers more styles, finishes and options than ever. Designed for precise, responsive control every time, no matter where you touch. You can easily control and change the water temperature above the deck using the faucet handle. All Touch2O models are water-efficient, underlining Delta's comittment to conservation. The pull-down spray wand comes free with a gentle tug and gives you total flexibility. Cassidy Single Handle Bar/Prep Faucet, Arctic Stainless Bar/prep faucets go beyond the kitchen, to butler's pantries, morning kitchens and more. 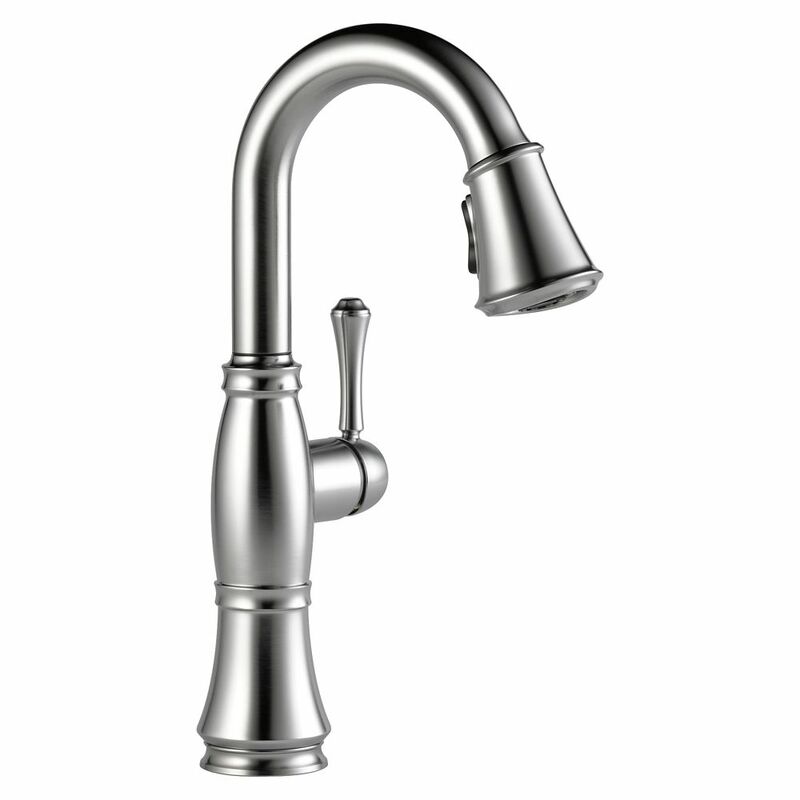 Cassidy Single Handle Bar/Prep Faucet, Arctic Stainless is rated 4.8 out of 5 by 22.